We spend most of our time with smartphones and tablets web browsing and playing games. When it comes to browsing, we get very impatient even with a few seconds delay; it’s like we want every page to load the second we demand. On Android smartphones and tablets, most of the browsing we do is thanks to Google’s Chrome and Microsoft’s Firefox. Here are a few tips to speed up Android web browsing! If you too are frustrated with slow web browsing, here is how to speed up Android web browsing. This very simple Android trick will make your Chrome browser much faster and lag-free even on the older Android devices. This trick allows the browser to use more RAM to improve performance and give a lag-free scrolling. While this is a simple trick, which can be performed even by the novices, it improves the performance in web browsing, scrolling and loading sites that are full of images and GIFs. As with many a programs, some features are kept hidden until they are ready to be integrated with public offering. Here is how we can use some tricks to get to those hidden features and speed up Android web browsing. Open the Chrome browser on your Android smartphone or tablet. Scroll down and look for Maximum tiles for interest area (#max-tiles-for-interest-area) in the list. 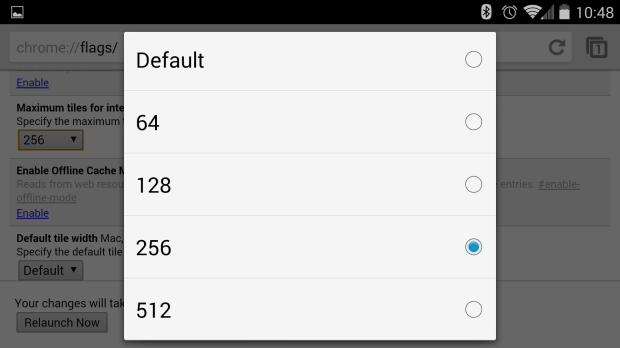 Tap on the drop down menu titled Default and change it to 512. You can also keep it to 256 for older devices with less than a GB RAM. At the bottom, tap on Relaunch Now to confirm changes. These simple steps will noticeably improve web browsing, especially you will experience smoother scrolling in the web pages heavy with images. Samsung Galaxy S4, HTC One, Samsung Galaxy S3, Moto and Nexus latest models will benefit from this little tweaking with Chrome. Please note that it is advised not to mess with other flags or settings in the URL shared in the steps above as some might cause instability or other unexpected changes. Of course, you can play whatever you want at your own risk.